To make the wine-poached cranberries, put the red wine in a saucepan with the sugar and cinnamon. Heat slowly, stirring a little to help the sugar dissolve. Put the cranberries into the wine, turn the heat up until the liquid is simmering, and poach slowly until the berries are tender (about 20 minutes). Remove the poached berries to a dish and reduce the wine by boiling until you have about 250ml (9fl oz) left. Let this cool slightly, then pour it over the cranberries. Remove the cinnamon stick. 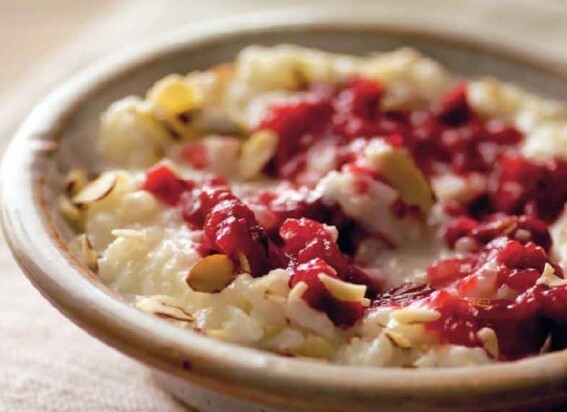 While the berries are cooking, make the rice pudding. Put the rice, milk and sugar in a heavy-bottomed saucepan and gently bring up to the boil. Turn the heat down low and leave the rice to cook, stirring it frequently, for about 15 minutes, or until the rice is tender and the milk has been absorbed. If the milk is absorbed too quickly – perhaps because your heat is too high – add a little more. Stir in the vanilla extract and almonds. Let the rice cool, then fold in the whipped cream. Serve cold or at room temperature with the warm berry compote.